September 1, 2016 – Drawing on the heritage of the GN Group’s long-standing headset and hearing aid expertise, Jabra continues to pioneer unparalleled sound capabilities with the launch of the unrivaled Elite franchise. The first product to market from the franchise, Jabra Elite Sport are the most technically advanced, true wireless sports earbuds* available. They are the ultimate training aid that delivers freedom of movement on any terrain. The fully sweat and waterproof Jabra Elite Sport are packed with advanced features including ground-breaking in-ear fitness analysis, strong battery life and great music for anyone who wants to work out. The Elite Sport supports all major smartphone operating systems (both Android & iOS) with a focus on in-call experience. The earbuds analyze external sounds and automatically switch to the earbud with least background noise. These state-of-the-art earbuds deliver superior audio quality for calls and music without wires. With an array of ear gels and ear wings presented in-box, as well as foam tips for passive noise-cancellation and enhanced bass, you can be confident of a secure, comfortable fit. At the same time, audio pass-through allows you to tune-in to surroundings at the touch of a button. When it comes to phone calls, Jabra Elite Sport benefits from two integrated microphones in each earbud. One captures your voice and the other focusses on external noise. Together, the earbuds overlay the two feeds, identify the background noise and remove it, allowing you to take calls without interruption, listen to your favorite songs or hear in-ear training tips. If a call comes in while running, voice controls and audio prompts let you manage calls without having to touch your phone. 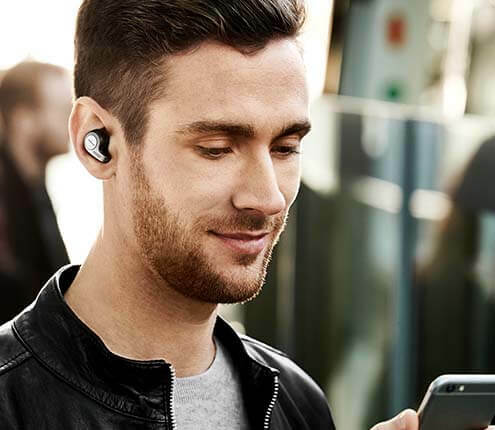 The earbud will run up to three hours of calls and music when fully charged – more than enough for most workouts – plus up to six hours of additional charge from the compact carry-case. With 77 percent** of people preferring to train without wires, (to avoid the cable getting caught and pulling the earbuds out), and 69 percent** regularly listening to music as they workout, it’s no surprise the first offering in the Jabra Elite true-wireless franchise comes with sports credentials. Jabra Elite Sport delivers the most comprehensive range of audio training tools to ensure you have the perfect training companion with you, whatever your fitness level or work-out regime preference. This includes advanced personalized fitness analysis thanks to an in-ear heart rate monitor with 90%+ accuracy and an integrated app that offers automatic fitness testing (VO2 Max measurement), race-time predictor and recovery advisor. The Jabra Sport Life app (iTunes and Google Play) delivers these updates via real-time in-ear coaching to ensure an uninterrupted workout. As a training partner, Jabra Elite Sport has the added assurance of a three year extended warranty against sweat***, and being IP67 rated, is tested to work for at least 30 minutes while submerged in up to 3 feet of water. 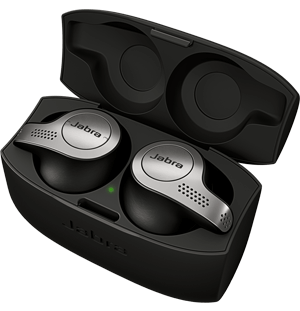 Jabra Elite Sport will be available for $249.99 exclusively at Best Buy stores on October 30. Pre-order on BestBuy.com will begin in late September.